very interesting! But its depressing to hear, that the creme de la creme of instruments are still the most expensive ones. Interesting also that he mentiones the playability a lot. It seems to be even at that level an important factor of a good instrument. Great interview Scott! Could you have a discussion regarding bows with Mr. Staryk? Say hello to him for me if you could. Big Staryk fan here! I second bows, although anything he wants to discuss will be most welcome. Thanks Scott! That was indeed a wonderful interview and a great read! Thanks everyone. I did mention a second conversation about bows to Staryk. Does anyone have any specific questions about bows that I could use? Could you please ask him what else can somebody do to break in an instrument, except from playing loud double-stops?? Are there any affordable modern bowmakers Maestro Staryk would recommend? Interesting and enjoyable! By chance, I recently finished the book about him, "Fiddling With Life" There is an appendix in that book, where he similarly talks about fiddles he's played on and their characteristics. There are many things I could comment on in the book, but will limit myself to fiddles: re the "Baltic" del Gesu, he said (p.221) that a drier ambience and a slightly nasal quality helped it to project and that he felt that real concert-hall del Gesus needed these characteristics. But early in this interview he says "I performed a concert on the Papini Del Gesu of 1739, but because both the hall and the fiddle were so dry, it was difficult to project." So, is dry good or not with a del Gesu? (Of course, dry halls are no fun. Was it the particular combo of fiddle and hall?) Oddly enough, I very briefly tried the "Baltic" in the mid-80's. The concertmaster of an orchestra I played in had it on loan to play a concerto. I found the tone lovely, but actually rather soft under my ear, and also when the CM played the concerto, it was similarly soft to me at some distance. I missed some edge. Maybe it was the set up at the time. That can make a big difference. How old is he now? 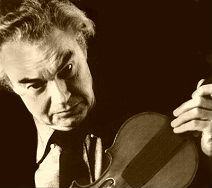 Does he still have the "Barrere" Strad? If not, what violin - and yes, bow - is he mainly using? Does he perform at all now? Teach? Practice regularly?